AClassPro, an Information Technology Industrial Training Institute, a training division of Baseline IT Development Pvt Ltd.
We have gained expertise in providing Industrial Training and assistance in Job Placement. "It was great experience studying here.good learning experience.Teachers are well experienced and they inspire you a lot , personal attention is given to students. Simply the best place. Its good to be learn from here. Thanks to teachers for making roots of all students strong. " "Excellent place to work, Transparency between Management and employee, Motivation, Excellent infrastructure, matured management from various domains, friendly environment. I am glad to be a part of it, after working in 5 start ups this is the place where I would like to get settled." "Excellent training giving by the staff. Getting opportunity to work on the online projects. Excellent staff, team members and organisation. " "I took the web designing course at A Class Pro. I must say the teachers were amazing. They knew how to teach so that we could understand easily and also highlighted the exception rules. They also used fun. " 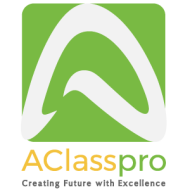 A Class Pro conducts classes in Adobe Illustrator, Adobe Photoshop Training and Bootstrap. It is located in Mohali SAS Nagar, Chandigarh. It takes Regular Classes- at the Institute. It has got 6 reviews till now with 100% positive feedback.